Homeowners fall in love with Renewal by Andersen® of St. Louis patio doors because of their distinctive character and customizable aesthetics. But, our products actually roll beauty and brawn into one. They feature a unique set of details that translates into exceptional strength and maximum security. The High-Performance™ Low-E4® glass of our patio door systems feature heat-strengthened interior panes, which have high breakage resistance. In turn, they’re less likely to be damaged during transportation and installation, allowing them to maintain their structural integrity for decades. The frames of our Frenchwood® and Narroline® patio doors are joined with mortises and tenons. Apart from producing a clean look, precisely measured and fitted mortise-and-tenon joints render our doors virtually impossible to break apart. Our hinged patio doors feature multiple locking points to keep both active and passive panels secure from the inside. When activated, all five locks fasten our doors to one another as well as to the header and threshold. Our sliding patio doors come with a unique Andersen® reach-out lock mechanism that pulls the active panel tightly into the jamb. When activated, it ensures excellent weathertightness and energy efficiency. All our patio door models have an exterior keyed lock to keep your home secure while you’re away. If you want to reinforce your gliding patio door system with another measure of security, we offer you an optional auxiliary foot lock. It provides an extra locking point when the active panel is in the locked position and offers partial ventilation while limiting access. 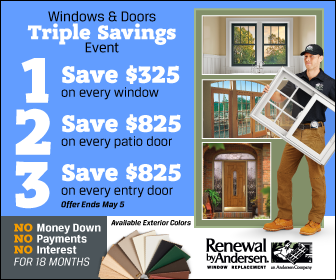 Outfit your patio with a strong and impregnable patio door system with Renewal by Andersen of St. Louis. To learn about our products and customization options, call us at (314) 332-2364 for your FREE consultation and estimate in St. Louis, MO.